Albert Stettner Jr., a mechanic from Berlin, Prussia, was a holder of 2 German (DE21236 and DE23098 from 1882) and 1 USA (US277627 from 1883) patents for keyboard adding machines. The patents DE23098 and US277627 are describing the same device. 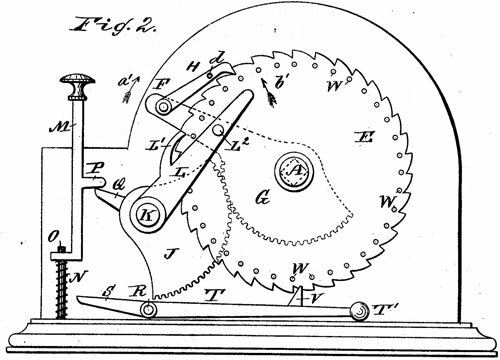 Let's examine the machine, using the patent drawing (see the image below). The adding-machine of Stettner has a spirally-grooved cylinder, carrying the numbers from 1 to 1000, which cylinder is revolved more or less, according as the series of key-rods are depressed, which key-rods are provided with tappets acting on projections on a shaft provided at the end with a segmental rack, engaging with another segmental rack made integral with an arm loosely mounted on the shaft, and provided with a pawl engaging with the teeth of a ratchet-wheel rigidly mounted on the end of the shaft. The invention further consists in a shaft provided with projections extending below the key-rods, and at the end with an arm having a tooth which passes in between studs on the ratchet-wheel, for the purpose of preventing the ratchet-wheel from being rotated too far. The cylinder B is so adjusted that the zero will show in the opening Y. Then the operator begins to add by depressing the keys corresponding to the numbers that he wishes to add, and after he has added the numbers, he reads off the result by looking into the opening Y. If one of the key-rods M is depressed, its projection or tappet P strikes the corresponding projection, Q, of the shaft K and turns the said shaft and the segmental rack J. As the said segmental rack engages with the segmental rack G the arm F will be swung in the direction of the arrow a', and the pawl H, engaging with the teeth of the wheel E, swings the said wheel in the same direction. The wheel is moved in the direction of the arrow a' a greater or less distance, according as the shaft K has been revolved a greater or less distance, and this distance again depends on the key-rod that has been depressed, for, as has been stated above, the key-rods representing the higher numbers are depressed a greater distance than those representing the lower numbers. That the cylinder shall not be rotated too far in case the key-rods are depressed too suddenly, Stettner has provided the check-lever T, so that the key-rods M can strike the corresponding projections, S, on the shaft R, and thus throw the inner end of the arm T upward, causing the tooth V to pass upward and in between the studs W, thereby arresting wheel E.
After the numbers have been added, the cylinder B must be turned backward again, so that its zero will be under the opening Y, and to permit this the pawl H must be disengaged from the teeth of the wheel E. This is accomplished by swinging the arm L in the direction of the arrow b', whereby it strikes against the stud d on the pawl H and disengages the same, and then the shaft A can be turned in the inverse direction by means of the key Z. The pawl L' checks the wheel E and prevents it from being rotated backward when the racks G J swing downward.